If you have not received an invite from a friend, click here to go to a page where you can put your e-mail in and google will alert you when you are able to sign-up without an invite. You can also get in touch with us and we’ll invite you over. We put twice as much RAM into our already powerful RealtyNinja servers. This will significantly increase speeds. Now your website will automatically display upcoming open houses. It will display a “open house” ribbon on the top corner of the listing photos (also on your homepage’s featured listings) and add a list of upcoming open house dates, times and notes on the listing’s detail page. Note: The open house data is pulled in automatically from the information entered into MLXChange. 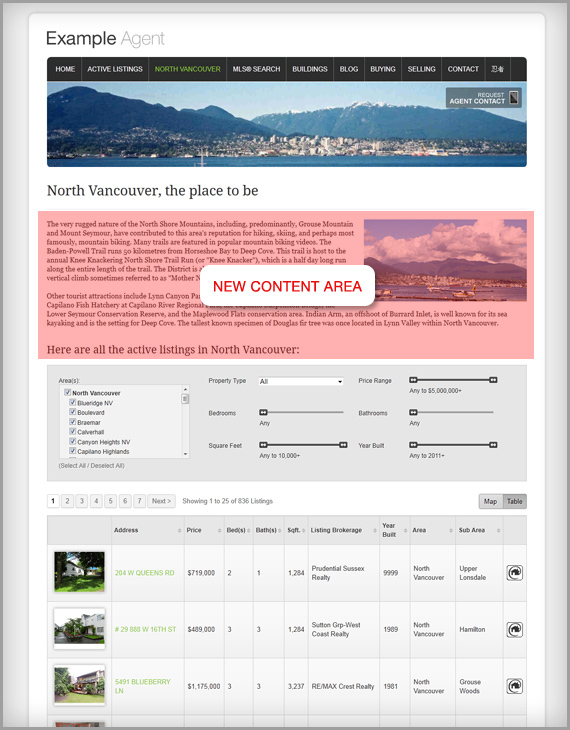 We’ve re-written most parts of the code that controls the visual website editor in RealtyNinja. The new editor will look the same but will make editing pages and content creation a much smoother experience. It will also produce much cleaner code that will help with SEO. 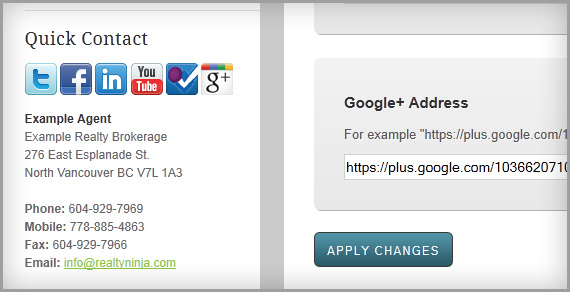 Listings (including all MLS® listings) now have a fully descriptive META title and URL. This helps search engines identify exactly what this page is about. It contains the website url, listing area, sub area, address and MLS number. Note: This is all done automatically so you don’t have to touch a thing. Now you can add a full-width content area to the top of your pages. This will allow you to add in extra content to any page on your website, including MLS® pages. Say you’re a North Vancouver specialist and you wanted a page on your website specifically about North Van that had information, photos, videos and all the active North Vancouver listings – now you can. The new content area is shown below in red. Bug fix: sometimes you were not able to delete a page once you made it a subpage.